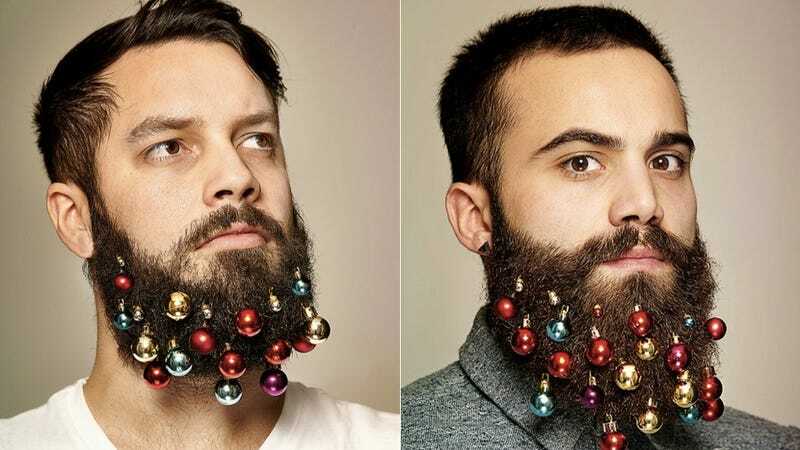 There's a new gift for the lumbersexual who has everything except something that'll make his face look like it's covered in strange metallic growths: Beard Baubles, which are Christmas tree ornaments for your beard. AdWeek reports that this little brainstorm comes courtesy of an advertising agency (of course). Mike Kennedy and Pauline Ashford, designers at Grey London, dreamed it up as an unconventional gift for clients. "Working in an ad agency, we're constantly tapping into what's hot in pop culture. Although Christmas and beards have always gone hand in hand right? Just look at Father Christmas," they told Mic. "Seeing as it's been a great year for the beard we thought it only fitting that we bejeweled them for the festive season." Indeed. Only fitting. Fortunately all proceeds go to Australian melanoma charity Beard Season. Otherwise this ridiculousness might literally kill me. And it probably will, once somebody inevitably copycats the idea and starts selling these things on Etsy.Anyway, down with beards and also Christmas. Christmas Must Be Stopped. Let&apos;s Declare War on Christmas.